Get instant access to common security and privacy risks found from over more than 300 vendor assessments. SIMBUS Tracker is a powerful Vendor Management Software designed to consolidate and monitor vendors who have access to PHI and other types of personal information. Vendors from all over the world have multiple information security and privacy protection legal requirements with which they must comply. SIMBUS Tracker provides all types of organizations that contract vendors to perform business activities on their behalf, a powerful tool to perform oversight of their BAs and vendors, and consolidate all necessary compliance verification information and associated records into one simple-to-use platform. Sign up for a private demo and see how SIMBUS Tracker seamlessly manages the Organization/Vendor relationship. Saves time and resources by managing all vendors in one convenient location. Bottom line, SIMBUS is good for your business and protects clients data. By monitoring vendor activity, Tracker will help avoid costly breaches. No other program manages vendor relationships in one easy affordable solution. There’s too many features to list. Give SIMBUS a try. It’s guaranteed for 30 days. SIMBUS Tracker Vendor Management is the only product of its kind that offers this many tools in one easy to manage platform. Never has there been a more comprehensive 3rd party oversight solution at this price. Get a customizable dashboard immediately upon checkout. Add Logo, photo and pick header colors. Add vendors individually or up to 10,000 using CSV format. Mass import sends automatic invite to dash. 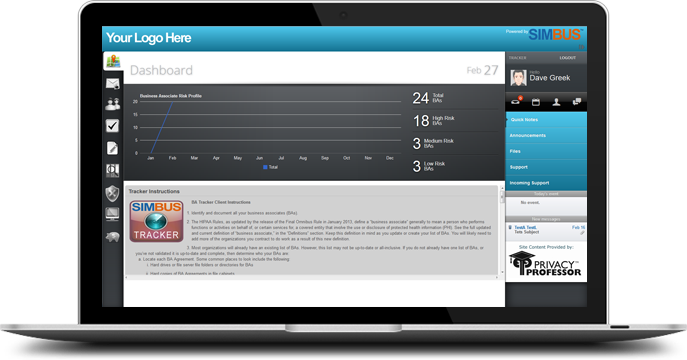 Vendors receive a welcome email and a customizable dashboard where they manage the relationship. Vendors are instructed to complete a Compliance Risk Evaluation which is sent to admin for review. Each Vendor receives a file repository to store business associate agreements and other required documents. Vendor can use the included Breach Management tool to manage breaches and notify Covered Entity. CE can create forms or agreements and send to vendors for signature and upload through the system. Tracker was designed from the ground up to look great on tablet PC’s and smart phones and any browser. Tracker comes with help videos that can be accessed inside the system. More are being added monthly. Support is offered through tickets, an internal messaging system and a powerful moderated forum. Your just seconds away from having the most powerful vendor management software available. Get instant access and immediately add vendors and begin managing relationships. Rest easy knowing your associates are now being managed in one convenient location. Save money and FREE up precious company resources. 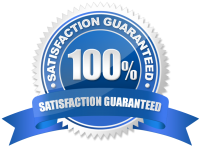 SIMBUS Tracker comes with a full 30 day money back guarantee. Need to see more? We love giving Demos. Discover the true power of SIMBUS360 Tracker and how it can completely change the way you manage Vendors. Please complete the form and we’ll contact you. Each Vendor added to your system receives a welcome invite email and login information and is directed to their private dashboard. They immediately see their profile and agree to terms and conditions for the software. Upon agreeing, they are directed to our internal Risk level Evaluation where they spend approximately 7-10 minutes answering questions about their organization’s compliance. The answers provided results in a score of low, medium or high risk and these results are noted in the Vendors profile which can be reviewed by you as the tracker administrator. In the event of an unfavorable score you have the ability to send additional documentation, tasks or anything you feel is needed to continue the relationship. Similar to your dashboard, the Vendor has access to several tools and communicates directly with you through the system. Each Vendor has their own file repository eliminating the need to store important documents outside the system. Navigation is very similar to the admin tracker panel and includes the dashboard, messages, incoming tasks, the Risk Evaluation, and a private file storage system. We also include a breach section. The breach section is critical and fully manages breaches that occur in the vendors company. Vendors can add notes, print reports, set dates, keep track of all parties and document findings and assign tasks all through the system. All breaches entered are automatically sent to the tracker admin where the outcome can be monitored. Tracker comes with full reporting and query capability allowing Administrators to view and print reports using PDF or Word Doc. There’s simply no other Vendor Management Solution that offers this level of oversight.